Should You Opt Back In to Receive Targeted Credit Card Offers? In an earlier post, I spoke about a targeted offer for 70,000 United miles via the MileagePlus Explorer Business card. Normally that offer is only 50,000 miles, but the individual who received it was targeted and sent a mailer because they’re opted in to offers via postal mail from Chase. Or perhaps they didn’t opt out – in any case, they receive offers, which can be a good thing if you’re constantly on the prowl for the very best credit card offers. However, you might be scratching your head, wondering why you don’t receive the same offers, or any offers at all. 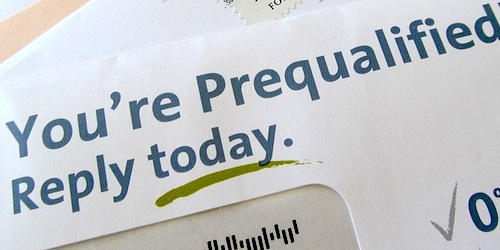 Could it be that you opted out in the past to stop all those nagging mailers? If so, you might want to change your settings and get back in the mix. I already wrote about how to opt out, but maybe it’s time to opt back in. With Chase, they have a dedicated URL (https://dnmoptions.chase.com/) called the “Chase Mailing Options Online Registry” where you can update your mailing preferences. Once you input your name and address you can tell them which categories you’d like to receive offers for. You may want to limit it to just credit card offers, or perhaps checking and business banking offers too in order to get those handsome $500 bonuses. 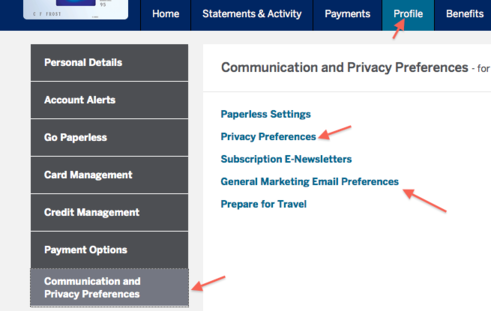 For American Express, existing cardholders can login at the website and navigate to “profile” then “Communication and Privacy Preferences.” From there you can update both your postal mail (privacy preferences) and e-mail settings to accept or deny offers. For Citi, there isn’t an option to opt in or out of receiving marketing offers for new cards and other Citi products. So you’re probably going to get offers unless you specifically opt out via chat or phone call. For Discover, you need to either call them or fire up a live chat and ask them what you can opt in or out of. There’s nowhere on the website to manage these settings either. Same goes for Bank of America; they don’t let you manage anything online, so a call or chat is required to change anything. I actually had them opt me out of the convenience checks they send all the time. I never actually use them and don’t want to keep tearing them up each month. And the ones from Barclaycard Arrival Plus are much better. Aside from working directly with the credit card issuers, you can also go to the OptOutPrescreen website and manage your preferences globally. If you previously opted out, you can opt back in there as well. Once you do, you’ll be eligible for “Firm Offers of credit or insurance,” which may include credit card offers even if you’re not already a customer. Finally, don’t forget that you can also take a proactive approach and call your credit card issuers to see if they have any special offers for you. There’s a chance they’ll be able to offer you something you may have overlooked, or potentially match an existing offer that is generally reserved for targeted consumers. Keep in mind that you can always change these preferences back if you feel you’re receiving too much mail.